'Let Me In' – the 2010 American adaptation of Swedish novel 'Låt den rätte komma in' by John Ajvide Lindqvist – was the last in the series of Hammer film screenings presented by The Flicker Club at the VAULT Festival, and I was fortunate enough to attend this portentous occasion in the atmospheric setting of the Old Vic tunnels. The film was preceded by two guest introductions, starting with a talk from Empire journalist Damon Wise, who offered his own critical view of the film and how it diverges from the 2008 Swedish adaptation, 'Let The Right One In', helmed by 'Tinker Tailor Soldier Spy' director Tomas Alfredson. He mused that although both films share certain similarities, 'Let Me In' is more of a horror film in the classic sense than its arty Swedish counterpart. This was followed by a guest reading from actor Dexter Fletcher (perhaps most famous for 'Lock, Stock & Two Smoking Barrels'), who recited a particularly tense extract from the novel, leaving us all eagerly awaiting the film. Set in Los Alamos in New Mexico, 'Let Me In' tells the story of 12-year-old Owen (Kodi Smit-McPhee), an isolated and lonely boy who finds himself the victim of vicious school bullying. The sparse courtyard of his apartment block provides the setting for his first encounter with Abby (Chloë Moretz), his newly arrived next-door neighbour – a peculiar girl who walks barefoot in the snow, likes puzzles and requires human blood to survive. The child and the vampire forge a hesitant friendship, and subsequently an innocent romance, communicating with each other through their bedroom walls using Morse code. However, events quickly take a more sinister turn as Abby’s thirst for blood leads her to exposure and Owen discovers her secret. Having been quite a fan of the original Swedish-language adaptation, I was a bit apprehensive about whether 'Let Me In' would be able to match its quality. However, for the most part, director Matt Reeves has stuck closely to Alfredson’s template, crafting a film that’s very similar to its predecessor, albeit without the breath-taking art-house aesthetics and touches of bizarre Swedish humour – it’s a shame that Reeves omitted the hilarious cat attack scene from the original. Moretz and Smit-McPhee are very well cast and have remarkably natural chemistry, with Smit-McPhee’s wide-eyed innocence complementing Moretz’s eerie detachedness. As Damon Wise rightly pointed out, 'Let Me In' plays up the elements of horror to a greater degree than the Swedish original, perhaps side-lining the delicate coming-of-age narrative as a result. 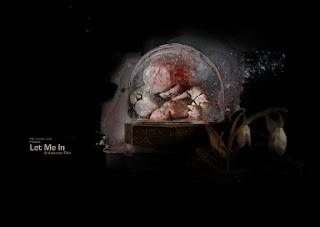 Although it didn’t quite resonate with me as much as Alfredson’s 2008 version, 'Let Me In' is nevertheless a gripping and enjoyable film in its own right. For more info on VAULT, head to thevaultfestival.com. Purchase at Amazon.co.uk.